Bad a Boom? No! Good a Boom? YES!!!!! Goodaboom might be the smallest planet in the universe, but it is probably the craziest and surely the youngest, being born on 25th December 2006. A painter and a musician live on it. I am Miki, the painter. I want to share my life on Goodaboom with you, in words and in pictures, and tell you everything about my art, his music, and everything else which makes my life here so unique! He looked quite disappointed. My brain went into overdrive, thinking, well, I haven´t got any, but I could paint some for him... 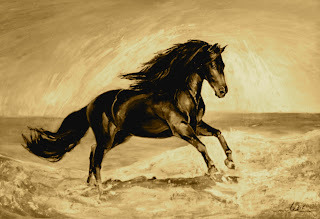 I had already painted horses on commission, and the people always loved them. In the meantime all the traffic was backed up behind him and the drivers had started beeping impatiently. I repeated my answer, but the cacophony was so loud, that he couldn´t hear anything. He came to tell me that he had a poster, and already tried to commission a painting from another painter, but somehow, the painter let him down after some weeks. He said I seemed to have such a talent for the representation of animals and he would love me to paint the horse from the poster. We discussed about the technique, size, price and delivery time. He said he would come back before nightfall. But THAT man came back with his horse. I thought as I saw the poster. Without doubt it was a wonderful horse, a perfect horse... too perfect perhaps, everything being too perfect there, the horse, the blue sky, the blue sea... I instantaneously imagined a possible way to transform this perfection into romantic art, using only sepia and white pastel. I tried carefully to lead the client –oh god, I just wanted to write „the patient“!- to this view, but no, he wanted the painting exactly like the poster. And as big as possible, 100 cm wide would be perfect. At least I convinced him to let me do the painting in gouache, as I thought that oil or acrylics would increase the kitsch touch. He wanted the painting for Christmas, but I had got a portrait commissioned for Christmas on the same day (see „Ho Ho Ho Christmas“)and promised him to finish it for the wednesday after. And so it transpired that after finishing the Chrsitmas Baby I started the Black Horse on Christmas Eve. I must confess that I felt some panic about that horse in the days before. I had no idea if I could somehow avoid the kitsch and was quite sure, I couldn´t! It is not for me to say if I succeeded in avoiding th kitsch trap: but here it is! The client called me yesterday morning. I noticed a certain mistrust, I guess he was not sure at all, after this last experience with the other untrustworthy painter, that I would have really done it. The client laughed and said, he would be there in 10 minutes. Unfortunately I didn´t see his first reaction to the painting as I was busy on the phone. But his words of praise left me in no doubt about his feelings. THIS IS THE MOST IMPORTANT THING FOR ME: NOT THE MONEY, NOT THE SUCCESS, BUT THE CLIENT´S JOY! I was born in France, was a mathematician in Germany and I am now a painter in Spain: What will be the next? Rocker on the Moon? My entire life is an incessant jumping between all the extremes... without bridges and without nets! Je parle francais, I speak english, ich spreche deutsch, hablo espanol, gavariu nemoshka pa ruski... so don´t hesitate to contact me!